Sai Pallavi is surely one of the finest artists in the country. She was compared with legendary actor Savitri after the release of her first Telugu outing Fidaa where she played a girl hailing from Telangana and falling in love with an NRI played by Varun Tej. Besides winning critical accolades, the film went on to become a super hit. Vachinde song from the film became a sensation and it got record views. It was the highest viewed south Indian song. But, the record is now broken by Rowdy Baby. 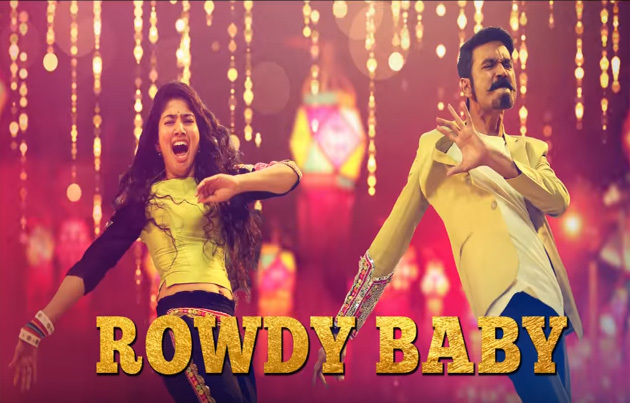 As is known, the song Rowdy Baby from Dhanush and Sai Pallavi’s Marri 2 won hearts not only in Tamil Nadu but from all around the world. The brilliant dance by Dhanush and Sai Pallavi, choreographed by Prabhudheva has found fans all around the world. The song, crooned by Dhanush and Dhee is now the highest viewed south Indian song with 183 million views (18.3 Cr). Vachinde song got 182 odd million views so far. Nonetheless, the Balaji Mohan directed film ended as an average grosser in Tamil and a flop in Telugu.